The online version of this article ( https://doi.org/10.1007/s12253-019-00652-x) contains supplementary material, which is available to authorized users. Malignant pleural mesothelioma (MPM) is a rare, aggressive tumour. Despite recent advances in chemotherapy, it is associated with a universally poor prognosis. In 80% of cases, MPM can be attributed to asbestos fibre exposure with a median latency of at least 32 years [1, 2]. Histologically MPM can be classified into epithelial, biphasic and sarcomatoid subtypes. The epithelial subtype is associated with longer survival when compared with sarcomatoid [3, 4]. With the administration of cisplatin/pemetrexed the median survival of MPM is still only 12 months and currently there is no widely approved second line regimen after failure of first line treatment [5, 6, 7, 8]. Arachidonic acid is metabolised by lipoxygenase (LOX) enzymes to form leukotrienes (LTs) and by cyclooxygenase (COX) enzymes to form prostanoids, including prostaglandin E2 (PGE2) which has been implicated in inflammation and carcinogenesis [9, 10, 11, 12, 13]. COX exists in two forms, COX-1 and COX-2. COX-2 is overexpressed in a wide variety of tumours and this feature has been correlated with the malignant properties of cancers. Inhibition of COX-2 has been reported to reverse malignant behaviour such as antiapoptosis, angiogenesis and invasion [14, 15] and epidemiological evidence suggests that regular use of COX-2 inhibitors may reduce the risk of several cancers . We have previously shown using immunohistochemistry (IHC) that COX-2 is overexpressed in MPM and that the specific COX-2 inhibitor DuP-697 can potentiate the in vitro cytotoxic effects of pemetrexed in MPM cell lines [4, 17]. Functional interactions between COX-2 and LOX enzymes have been identified  and, of the three known LOX isoenzymes (5-LOX, 12-LOX and 15-LOX), 5-LOX and 12-LOX have also been implicated in carcinogenesis [13, 19]. The 5-LOX enzyme interacts with 5-LOX activating protein (FLAP) and converts arachidonic acid into LTA4. LTA4 can be converted into 5-hydroxyeicosatetraenoic acid (HETE) or can be hydrolysed into LTB4 or LTC4 [12, 20]. LTB4 has been shown to cause cell proliferation and survival via its action on the ERK pathway in colon cancer cell lines and via the PI3K-AKT and MAPK pathways in pancreatic cancer cell lines [21, 22]. Arachidonic acid is converted into 12-HETE by its interaction with 12-LOX . The 12-HETE enzyme interacts with the NFkB pathway, resulting in an antiapoptotic effect, in prostate cancer cells  and may interact with various growth factors resulting in angiogenesis, invasion and metastasis . The expression of 5-LOX and 12-LOX has been associated with carcinogenesis in various solid tumours. Hong and colleagues reported the first evidence of the potential role for 5-LOX in cancer through the demonstration of expression of 5-LOX and FLAP transcripts in different epithelial cancer cell lines . 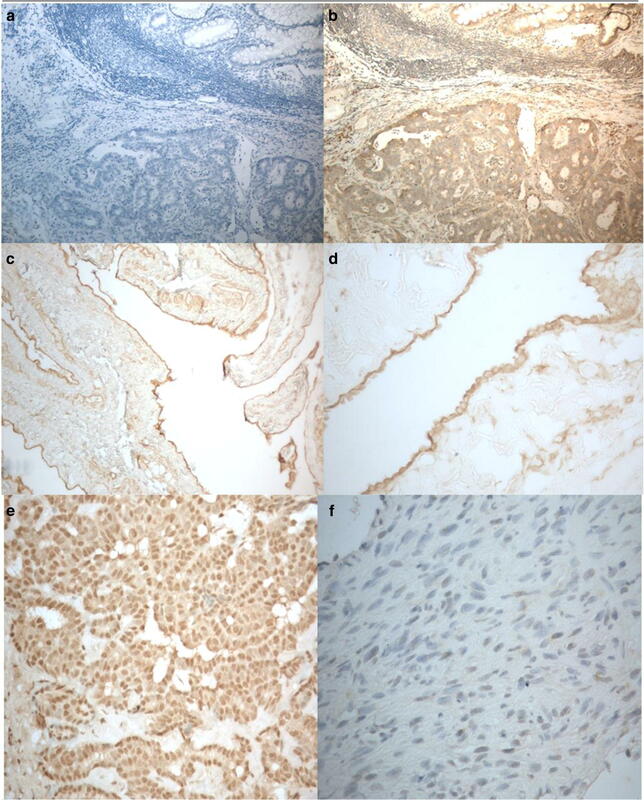 Increased expression of 5-LOX and LTB4 transcripts was later demonstrated in human pancreatic cancer cells, when compared with cultivated normal pancreatic ductal cells  and a 6-fold upregulation of 5-LOX transcripts was demonstrated in prostate cancer tissue, when compared with a matched benign tissue sample  The overexpression of 5-LOX protein was demonstrated in 22 matched samples of benign and malignant tissue obtained from patients with prostate cancer, when assessed by immunoblotting and IHC . This immunoblotting analysis demonstrated overexpression of 5-LOX protein in 73% of samples with a 2.6 fold greater expression in the malignant tissue and the immunohistochemical analysis confirmed the up-regulation of 5-LOX protein in malignant tissue . Further studies on the overexpression of LOX enzymes have since been documented in other epithelial cancers, including bladder , breast , colon , melanoma , oesophagus [32, 33], and oral . The role of LOX enzymes in MPM has not been widely studied. 5-LOX transcripts were demonstrated to be upregulated in MPM cell lines, when compared with normal mesothelial cells, whilst the expression of 12-LOX transcripts was detected in both normal and malignant cells . We therefore aimed to investigate the importance of 5-LOX and 12-LOX protein expression in MPM and benign pleura tissue samples and to study the effects of in vitro inhibition of the arachidonic acid pathway in MPM cell lines. Research Ethics Committee approval was granted for the study (ref 11/00/212). Archival MPM tissue samples were obtained from 83 patients diagnosed between 1992 and 2000 at Hull Royal Infirmary, UK. The majority of patients were male (76/83; 92%). The original diagnostic histology slides were reviewed by a histopathologist specialising in MPM (AC) and clinicopathological details for all samples were available. There were 44/83 (53%) epithelial, 25/83 (30%) biphasic and 14/83 (17%) sarcomatoid histological subtypes. In order to investigate benign pleural tissue, 8 archival samples were obtained which were derived from male patients who had undergone thoracoscopic intervention to prevent recurrence of spontaneous pneumothorax. These 8 samples were classified histologically by a histopathologist (AC) into non-reactive (n = 2), mildly reactive (n = 2) and very reactive (n = 4) based on the reactivity of the mesothelial cells. The 83 archival MPM tissue samples and 8 benign pleural tissue samples were analysed by IHC as previously described  with minor modifications. In brief, endogenous peroxidase enzymes were blocked and antigens were heat-retrieved by boiling under pressure for 3 min at 15 psi in 1:100 Antigen Unmasking Solution (H-3300, Vector Laboratories Inc.) within a stainless steel pressure cooker. Non-specific staining was blocked using normal horse serum (#PK-7800, Vector Laboratories Inc.) and endogenous biotin and avidin binding sites were also blocked (#SP-2001, Vector Laboratories Inc.). Incubations with anti 5-LOX (#ab169755, Abcam) or anti 12-LOX (#ab23678, Abcam) antibodies were performed using a dilution of 1:100 for 2 h. Negative (antibody-omitted) control and positive control slides, which consisted of archival colorectal cancer tissue, were included in each batch. Antibody localisation was detected and visualised using a streptavidin/peroxidase method (#PK-7800, Vector Laboratories Inc.) with DAB as chromogen. Slides were counterstained with haematoxylin and independently reviewed by 3 of the co-authors, including a histopathologist specialising in MPM (AC). Discordant scores were reviewed in open discussion. For MPM samples, “positive” protein expression was recorded if there was moderately strong staining in more than 25% of the malignant cells and “negative” protein expression was recorded if no, or only weak, staining was seen or if staining was seen in less than 25% of the malignant cells. Statistical analysis was performed using SPSS software version 19.0 (SPSS, Chicago, USA). Univariate analysis was carried out for 5-LOX and 12-LOX expression using Kaplan Meier survival curves with log rank analysis. Multivariate analysis was calculated using Cox regression analysis to take into account the histological subtypes which are known to be an independent prognostic variable in MPM . The MPM cell lines NCI-H2452, NCI-H2052 and MSTO-211H were obtained from the American Type Culture Collection (ATCC). In addition, the non-small cell lung cancer (NSCLC) cell line A549 was obtained from the European Collection of Cell Cultures (ECACC). Cells were grown in RPMI 1640 medium supplemented with 2 mM L-glutamine, 10% (v/v) foetal bovine serum, 100 U/ml penicillin and 100 μg streptomycin in a humidified incubator with 5% CO2 at 37 °C. Cell lines were passaged at 70–80% confluence and regularly checked for mycoplasma contamination. Cells were grown to 70–80% confluence in then lysed in Laemmli buffer (65 mM Tris-HCl pH 6.8, 10% glycerol, 2% SDS, 0.001% bromophenol blue) with the addition of 5% β-mercaptoethanol and 1% protease inhibitor mix (#80–6501-23, Amersham Biosciences). Protein lysates were quantified using the RCDC protein assay (# 500–0122, Biorad) and 50 μg of protein was analysed per lane on a 12% acrylamide gel (#25222, Pierce) under reducing conditions and transferred to a nitrocellulose membrane using a semi-dry iBlot system (Life Technologies). Membranes were blocked in 5% non-fat milk before samples were probed for 2 h with the anti 5-LOX antibody (#ab39347, Abcam) at a final concentration of 1:250 and the anti 12-LOX antibody (#ab23678, Abcam) at a final concentration of 1:500. To serve as a loading control, the anti α-tubulin antibody (#ab7291, Abcam) was applied at 1:3000 for 2 h. Visualisation of protein bands was achieved using the SuperSignal West Pico Chemiluminescent Substrate kit (#34078, Pierce). Commercially available inhibitors were purchased as follows: zileuton (#3308, Tocris Bioscience), which is a 5-LOX inhibitor ; MK-886 (#1311, Tocris Bioscience), which is a FLAP inhibitor ; baicalein (#1761, Tocris Bioscience), which is a 12-LOX and 15-LOX inhibitor ; celecoxib (#3786, Tocris Bioscience), which is a selective COX-2 inhibitor . In addition, licofelone (ML3000) was provided as a gift by Professor Stefan Laufer (Department of Pharmaceutical Chemistry, Eberhard Karls University, Tübingen, Germany). Licofelone is a dual COX/5-LOX inhibitor . Stock drug solutions were prepared in DMSO and stored at -20 °C for further use. Drugs were diluted in fresh media prior to each experiment. Cells were plated in 96-well plates at 1 × 103 cells/well and grown overnight in supplemented media as above. After 24 h, cells were treated in replicates of 6 and cell viability was measured after 72 h using the CellTiter 96 Aqueous One Solution Cell Proliferation Assay (#G3581, Promega). Following the 3 h labeling of metabolically active cells with MTS, results were measured at 492 nm using an absorbance plate reader (Multiskan FC Microplate photometer, Thermo Scientific). Values were normalised to untreated control cells in order to generate dose response curves. At least 3 independent experiments were carried out for each drug analysis before IC50 values were calculated using GraphPad Prism 5.0 software. Student’s paired t test was used to assess the differences observed between single agent treatment and combinations (p < 0.05). To assess drug synergy between celecoxib and baicalein on cell growth inhibition of the cell lines, a combination index (CI) was calculated using data obtained from the MTS assay. Concentration-effect curves were generated as a plot of the fraction of unaffected cells versus drug concentration in accordance with the Chou-Talalay method  using the following CI equation: CI = (D1)/(D1a) + (D2)/(D2a) + (D1 x D2)/(D1a x D2a), where D1 and D2 are the concentrations of baicalein and celecoxib respectively that exhibited a determined effect when applied simultaneously to the cells and D1a and D2a are the concentrations of these drugs that exhibited the same determined effect when used as single agents. The CI values indicate a synergistic effect when <1, an additive effect when equal to 1 and an antagonistic effect when >1 . All 8/8 benign pleural samples exhibited similar nuclear and cytoplasmic staining patterns, irrespective of their reactive status (Fig. 1). In the MPM samples the expression of the 12-LOX protein was again predominantly found in the nucleus and cytoplasm of the malignant cells, with varying intensity (Fig. 1). Positive 12-LOX protein expression was recorded in 69/83 (83%) of MPM tissue samples (Table 1). The expression of 12-LOX was not associated with survival (p = 0.455). The 8 benign pleural samples exhibited differential expression of the 5-LOX protein based on their reactive status (Fig. 2). Where staining was observed, 5-LOX protein was localised to the cytoplasm and nucleus. Few inflammatory cells were seen in the 2 non-reactive pleural samples and the mesothelial cells exhibited no expression of 5-LOX protein. Mildly reactive pleural samples (n = 2) exhibited weak staining for 5-LOX in the mesothelial cells and very reactive pleural samples (n = 4) exhibited strong positive staining for 5-LOX in the mesothelial cells (Fig. 2). Of the 83 MPM tissue samples, 77 samples were successfully scored. 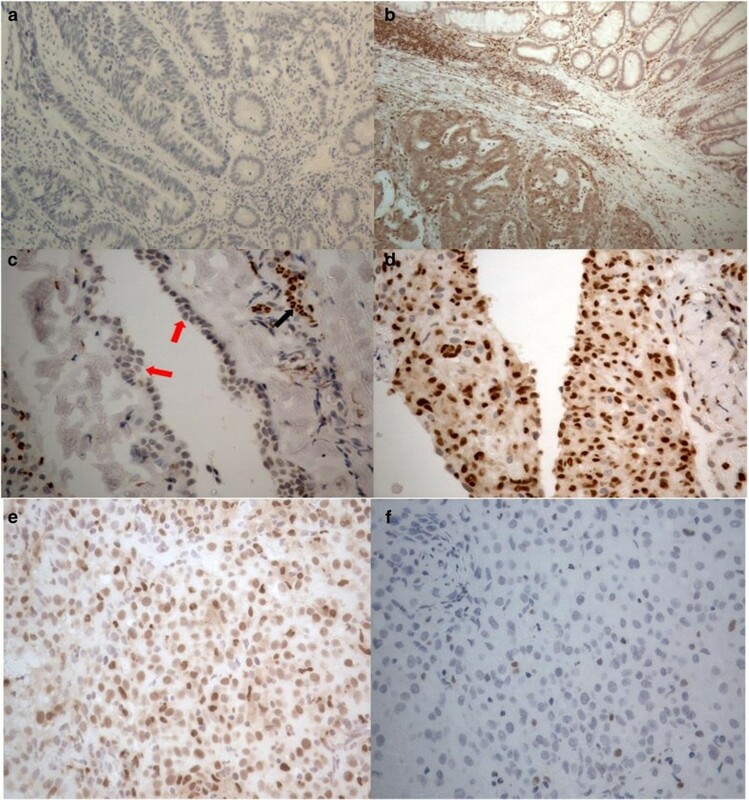 The immunohistochemical staining revealed nuclear and cytoplasmic expression of the 5-LOX protein in malignant cells with varying intensity (Fig. 2). Positive staining of lymphocytes and other inflammatory cells served as an internal positive control. Positive 5-LOX expression was observed in 56/77 (73%) of MPM tissue samples (Table 1). Overall, the expression of 5-LOX was not associated with survival (p = 0.640), however when considering only the sarcomatoid subtype the positive expression of 5-LOX was significantly associated with improved survival (median survival 4.2 months versus 1 month in 5-LOX negative cases; p = 0.028) (online resource 1). Co-expression of 5-LOX with 12-LOX was seen in 46/78 (58%) of the MPM samples but this was neither statistically significant nor associated with survival. We have previously published the COX-2 protein expression data for this cohort  (Table 1). A total of 41/77 (53%) of samples demonstrated co-expression of COX-2 with 5-LOX proteins and this status was significantly associated with improved survival when compared with cases which were negative for both proteins (median survival 8.7 months versus 2.2 months; p = 0.011) (online resource 1). Co-expression of COX-2 with 12-LOX was seen in 47/83 (56%) of the samples. In univariate analysis cases demonstrating a COX-2 positive /12-LOX negative status or co-expression of COX-2 with 12-LOX were associated with longer survival (online resource 1). The protein expression of 5-LOX and 12-LOX in the MPM cell lines is shown in Fig. 3 and the relative expression levels following normalisation, are summarised in Table 2. We have previously reported the expression of COX-2 in these cell lines . Positive expression of 5-LOX, 12-LOX and COX-2 proteins was identified in all of the MPM cell lines and the NSCLC cell line A549. Cell viability was determined in all cell lines following single-agent treatment for 72 h with increasing concentrations of the LOX pathway inhibitors baicalein, MK-886, zileuton and licofelone, in addition to the COX-2 inhibitor celecoxib (Fig. 3, Table 3). Celecoxib (COX-2 inhibitor) demonstrated similar anti-proliferative effects in all MPM cell lines with an IC50 range of 39.2 μM to 48.1 μM. At low concentrations, zileuton (5-LOX inhibitor) and licofelone (dual COX/5-LOX) inhibitor did not demonstrate an effect in any of the MPM cell lines. MK-886 (FLAP inhibitor) exerted an effect at low concentrations in 2/3 of the MPM cell lines, however baicalein (12-LOX and 15-LOX inhibitor) was effective in 3/3 MPM cell lines at low concentrations with an IC50 range of 9.6 μM to 20.7 μM. As a proof of principle, we investigated the effect of combining celecoxib and baicalein on cell viability using a clinically achievable concentration of celecoxib (3 μM; Table 3). A concentration of 10 μM was selected for baicalein based on the single-agent IC50 data for the MPM cells (Table 3). Cell viability was determined following combined treatment for 72 h (Fig. 4). MPM is highly resistant to tyrosine kinase inhibitors and the preferred treatment remains the combination of a platinum-based compound and a folate antimetabolite [5, 7, 8]. There are currently no approved second-line treatments for patients who do not respond to the chemotherapy regimen indicating an urgent need for the development of more effective therapies and a better understanding of this malignancy. Previous studies have demonstrated the potential role of COX-2 as a therapeutic target in MPM [4, 43, 44, 45] and the selective COX-2 inhibitor celecoxib has been included, in combination with other drugs, in clinical trials for patients with MPM . In the current study we have demonstrated that the 5-LOX and 12-LOX proteins are expressed in a significant proportion of MPM samples (73% and 83% respectively) and may represent novel therapeutic targets in this disease. The co-expression of COX-2 with 5-LOX was associated with improved survival in this cohort and, in the sarcomatoid subtype only, the expression of 5-LOX was associated with improved prognosis however these preliminary findings require further confirmation using a larger number of cases. The benign samples used in this study were from patients with an underlying condition which may lead to the presence of reactive mesothelial cells due to inflammation. 12-LOX expression was seen in non-reactive and reactive benign pleural tissue samples whilst 5-LOX expression was evident only in cases with reactive mesothelial cells. To our knowledge, this is the first study to investigate 5-LOX and 12-LOX protein expression in MPM tissue samples. 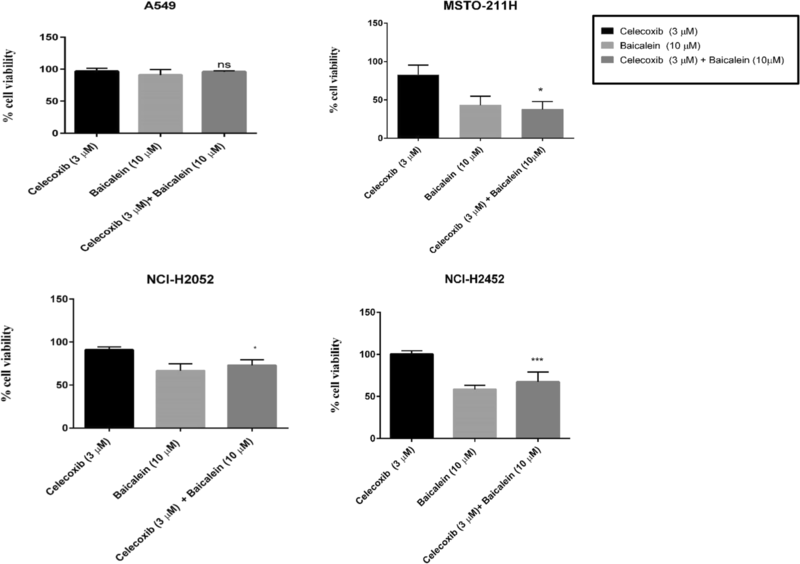 A panel of MPM cell lines, which exhibited expression of the COX-2, 5-LOX and 12-LOX targets, demonstrated no response to treatment for 72 h with the 5-LOX inhibitor zileuton at the clinically relevant concentration range. In each cell line, the IC50 for celecoxib was reached at a concentration which was outside the clinically relevant range. The maximum tolerated dose for baicalein, MK-886 and licofelone in humans is not available and therefore to further examine the in vitro effects of simultaneous inhibition of the COX-2 and LOX pathways we examined baicalein in combination with celecoxib, which was used at the clinically relevant concentration. Baicalein, which is known to inhibit 12-LOX as well as 15-LOX , had demonstrated an effect in all 3 MPM cell lines at relatively low concentrations as single agent when compared to the other LOX pathway inhibitors. Baicalein has been reported to reduce cell proliferation in vitro in other cancer cell lines at concentrations of 5–80 μM [47, 48, 49, 50] and may induce cancer cell death via inhibition of CDC2 kinase and survivin . There has only been one previous report of the baicalein treatment of MPM cells and no effect was seen when using a single fixed concentration of 2 μM . The in vitro combination results indicated that celecoxib/baicalein treatment may be more effective than celecoxib alone in these cell lines, however 10 μM baicalein alone appears to be mainly responsible for this effect with drug synergy demonstrated in only 1 cell line. In summary, this study has shown that 5-LOX and 12-LOX proteins are expressed at high frequency in mesothelioma samples and may represent therapeutic targets. The role of 15-LOX in MPM requires further study. 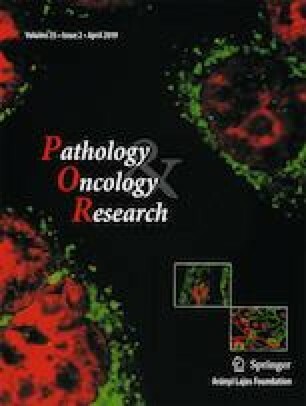 We acknowledge that inhibitors used within this study have been previously reported to inhibit tumour cells independent of lipoxygenase inhibition, hence further studies on the effect of the inhibitors on PGE2 and LTB4 levels in conjunction with cell death in mesothelioma cells requires further evaluation [51, 52, 53]. 12-LOX has also been reported to be predominantly expressed in the cytoplasm however nuclear localization of 5-LOX and 12-LOX have been reported previously by [54, 55]. As a proof of principle, we have demonstrated that the inhibition of mesothelioma cells using baicalein may be effective as a novel treatment for MPM, however further human pharmacokinetic studies are required in order to establish whether the concentration used in vitro is clinically achievable since the single pharmacokinetic study  in humans did not establish a maximum tolerated dose.